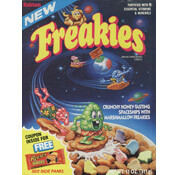 The box says that they're "...rolling out a great NEW cinnamon taste." And that is not false advertising. My mom makes one heck of a cinnamon roll and that's what this one smells like as it toasts. The taste doesn't quite live up to the smell, but it's still very good. It's what I'd call a minimalist Pop-Tart. So many Pop-Tarts - especially those that have come out in the last three years - hit you over the head with flavor (and usually sweetness). This one is more subtle. If you prefer toast with a sprinkle of cinnamon and sugar over a double-chocolate super donut, this is a Pop-Tart for you. The filling seems to be a re-working of the filling in Kellogg's Brown Sugar & Cinnamon Pop-Tart. But having it encased in a primarily wheat flour crust with swirls of frosting (as opposed to wall of frosting on other toasted pastries) makes this a unique Pop-Tart... an adult Pop-Tart. I was surprised to see that calorie and fat content was as high as the Frosted Caramel Chocolate Pop-Tarts I'd just reviewed. A one pastry serving contains 210 calories and 1.5 grams of saturated fat. 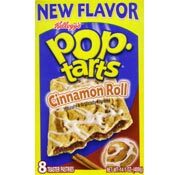 What do you think of Cinnamon Roll Pop-Tarts? I just paid an absolute fortune to buy them from eBay. Hope they are as good as everyone says. I just bought the red velvet kind too. I would make love to these pop tarts if I could. I really like this flavor-does anyone know who carries them? The store I found them at stop carrying them. The Cinnamon Roll Pop-Tart is ok, but nothing compared to the (unfrosted) Brown Sugar Cinnamon Pop-Tart. Nothing better than it warmed with a glass of cold milk. A true Pop-Tart Classic!